Willow bark contains a natural plant growth hormone called, auxin hormone. You can use this hormone to stimulate root growth on propagation cuttings by making a home-brewed solution called, ‘Willow Water’. First, you collect first-year twigs from any willow species (Salix spp. ); these twigs will have green or yellow bark. Older willow growth has brown or grey bark, so don’t use those. The willow leaves are not used, so remove all the leaves from your twigs and toss them into your compost. Take these willow twigs and cut them into 1-inch to 3-inch long pieces. You will need approximately 2-cups of twigs to make ½ gallon of willow water. Method A – Place the 1-inch willow twigs in a container and cover with ½ gallon of boiling water, let them steep for at least 24 hours, then strain the liquid into another container to remove twigs. Method B– Place the 1-inch willow twigs in a container and cover with tap water. Let twigs soak 48 hours, and after 2 days strain to remove the twigs. The willow water is now ready to use. First method: Pour some willow water into a small jar, and then place the cuttings you want to root into the willow water like flowers in a vase, soak the ends overnight. After soaking, plant the cuttings in a propagation medium. Planting medium suggestion is ½ vermiculite and ½ Coir (coconut fiber) or peat moss. Please note: coir is a sustainable planting medium, while peat moss is not. Second method: Plant the cuttings you want to root in a propagation medium, then use willow water to water these cuttings. Watering the cuttings with willow water twice should be enough to help them root. Store willow water in a jar with a tight fitting lid and keep refrigerated. Label the jar with Contents, Brew Date, and Expiration Date. Willow water keeps for up to two months if refrigerated, but freshly made willow water is more potent, therefore the longer it is stored the less effective it becomes. 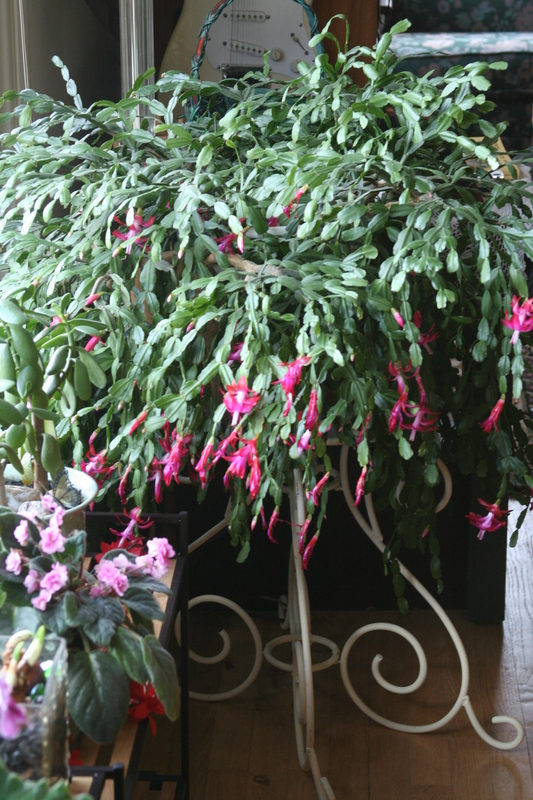 After your Christmas cactus has bloomed, re-pot it into a pot slightly larger than its current container. Christmas cactus roots can easily rot if the soil is too wet, so the pot must have a drain hole and be planted in a lightweight, well-drained potting mix. You can use potting mixes for cactus & succulents, which are readily available at garden centers, or you can make your own. Commercially made potting soils can be used for Christmas cactus soil, if they are amended. Choose a balanced pH soil mix without added fertilizers. The soil’s pH should be neutral, between 6.0 and 7.0, not too acid nor too alkaline. 1/2 potting soil, 1/4 horticultural perlite, 1/4 orchid bark. 1/3 Coconut Coir, 1/3 horticultural perlite, 1/3 fine fir bark. 1/3 soil-less potting soil, 1/3 horticultural perlite, 1/3 pine bark nuggets. Keep hummingbird feeders clean to prevent mold and fungus, which can be fatal to hummingbirds. Refill feeders frequently so there is always an adequate supply of nectar for overwintering hummingbirds. Do not prune shrubs or trees near feeding areas in fall so hummingbirds have plenty of sheltered places to perch and rest between feedings. Bring feeders indoors to warm/ defrost and rotate out with other feeders. Use a dome to protect from snow, sleet and ice. Position the feeder to protect from cold winds and exposure. Attach hand warmers to the feeder. Heat tape such as used for preventing pipes from freezing. Place a clamp-on/ clip-on shop/ work light adjacent to the feeder—about 12-24″ away would be as plumbers do when defrosting frozen pipes. Test the distance before you walk away. Try a 125 Watt infra-red light bulb, but not the red-glass type. Get an I.R. bulb with clear envelope, it casts a more natural light. Connect it all to a timer. Place holiday lights around, above or below the feeder. Do not obstruct access to feeding ports. Use common sense and your best judgment. Watering a green wreath depends on where it’s displayed, if it’s outside in a cool climate then no watering is required, but if it’s outside in a warmer climate, or display indoors, then watering is required. The wreath industry recommends upon receiving your green wreath, you place it in a couple of inches of water for at least an hour to give it an initial drink. Then once it’s displayed, you spray the wreath with water every few days, and watch for dryness. Outdoor: Keep your wreath out of direct sunlight and away from any heat source. If kept out of the sun, a wreath should last a month, often longer in cold climates. Indoor: If you’re having a party and want your wreath on display for the party, it’s best to wait until the last minute to bring it inside, and then take it outside as soon as the party is over. If, however, you are keeping your wreath indoors for the holiday, soak in water at least an hour, as stated about, spritz it frequently and watch for dryness. A green wreath left indoors only last 2 weeks and be aware that green wreaths kept indoors dry out quickly, and are a fire hazard!